Chick Schwartz was born in Lincoln, Nebraska in 1937. 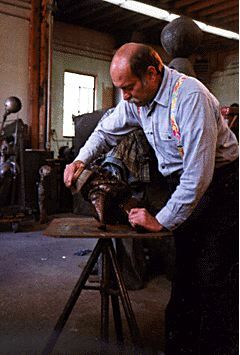 Although formally trained as an engineer, (Georgia Tech 1959 & 1960) Schwartz has been a practicing artist his entire life and art has been his principal source of income since 1980. He and his wife Marsha moved to their secluded hilltop farm in 1978 where they reared their four sons, built a large fuel fired kiln and grew much of their food. (trout, apples,berries, vegetables, beef and maple syrup.) For relaxation, Schwartz plays with his grandchildren, toots his tuba and writes political satire for several area newspapers. His art is exhibited in public, private and corporate collections on four continents. 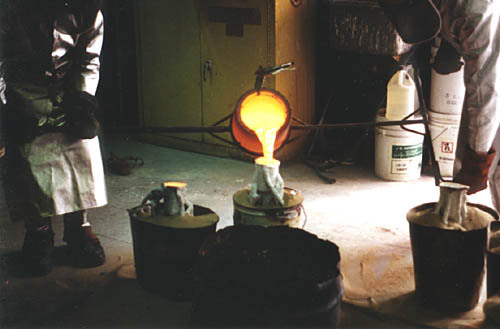 Casting a sculpture at the foundry. "A sculptor and a master at modeling, Chick Schwartz is an artist whose sculptural works toy playfully with the third dimension, an illusive presence which is felt more than emphasized. To this skillful achievement he adds insight, humour and irony, as well as a touch of curiosity for a variety of mediums. The combination creates works anchored strongly in technical accomplishment and narrative appeal. 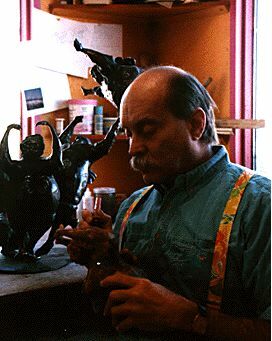 The stunning quality of Schwartz's artworks reflects this successful union of form and content....."
"This week I had the opportunity to preview the show of Quebec sculptor Chick Schwartz. And it blew me away. The total originality of his work defies easy categorization or description. He is probably best known for his 'Looking Downs.' These are ceramic high relief sculptures which hang on the wall and give the viewer a queasy feeling of vertigo. You want to grab onto someone to keep from falling into his streets crowded with hundreds of tiny citizens doing all the things with and to each other that happen in our society..... Do yourself a favor and catch the show by this imaginative and talented artist."  James Duff, editor the Montreal Daily News, 1989. "At first glance, Chick Schwartz's work seems intriguingly simple. Almost childish at times. His use of solid, bright colors in his ceramics at times give the work a sense of gaity usually found in the eyes of children. 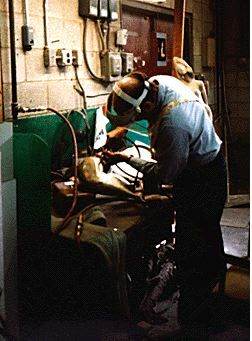 His solid forms in Bronze tend to be visually straightforward, rounded and weighty. Yet upon further scrutiny one notices the work embodies serious, often ironic themes.From feminism to religion to spatial perceptions, each piece deals with a problem that exists either in our world or within the piece itself. It is by solving these problems that he conveys his various messages. It takes a good eye to catch the details so integral to the larger whole, yet we must always look closely at anything in order to conceive of what is happening. Mr. Schwartz draws in his viewer with the aforementioned childish, easy accesible visual content, then before our eyes, we see this happy world change to one of despair, irony, beauty and humor....We have to ask ourselves, 'just what is important here?' and, as in life, it takes a very careful examination to find out the answer."  Jennifer Laden, curator, Postcrypt Art Gallery, Columbia University, 1991. "....The air of unbeing envelops the artist's pieces again and again, be they apparent or nearly Jewish intent - or be they part of another tradition altogether, as in the case of his Godiva: golden bronze bestride a bronze-green horse that is and isn't there, whose steed sweeps across space at a remarkable pace, while never leaving his pedestal. His Godiva may be as much a metaphor for the Jewish experience within the world at large - exposed but proud upon the gigantic steed of covenantal promise - as his Hassidic Discourse is an image of that experience inside a now gone eastern European Jewish World. The artist mixes media and stylistic elements as he mixes ideas that mey be identified as Jewish with those what echo other cultural realms through which Jews have moved like Godiva, on horses that are and are not there, painlessly and painfully, plodding and swiftly, and not at all."  Ori Z. Soltes, director, National Jewish Museum, Washington, DC, 1996.